I know I probably should save this for Thanksgiving, but for some reason it was in my head today and it just makes me smile and I wanted to pass that along. 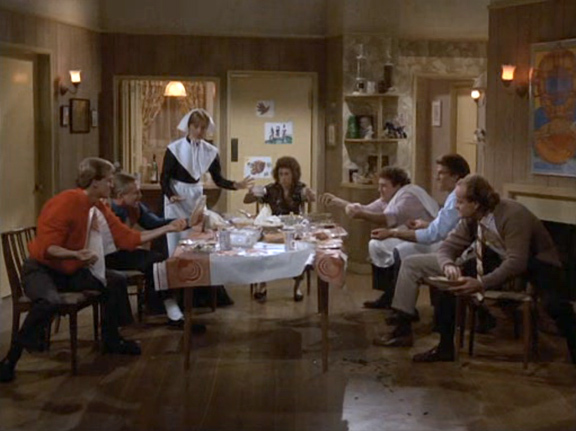 Picking a favorite scene from any season of Cheers is tough (I mean, this is the season where Diane leaves and there’s the iconic good-bye at the end of the year), but this is probably my favorite scene in the whole show. It’s just utterly stupid and joyful and I never get tired of watching Diane take a whap of mashed potatoes to the face, and the closest we get to seeing Norm’s wife in the whole show…just a pie away.